The Battle of Alexander at Issus is a 1529 oil painting by the German artist** Albrecht Altdorfer (c. 1480-1538), a pioneer of landscape art and a founding member of the Danube school. 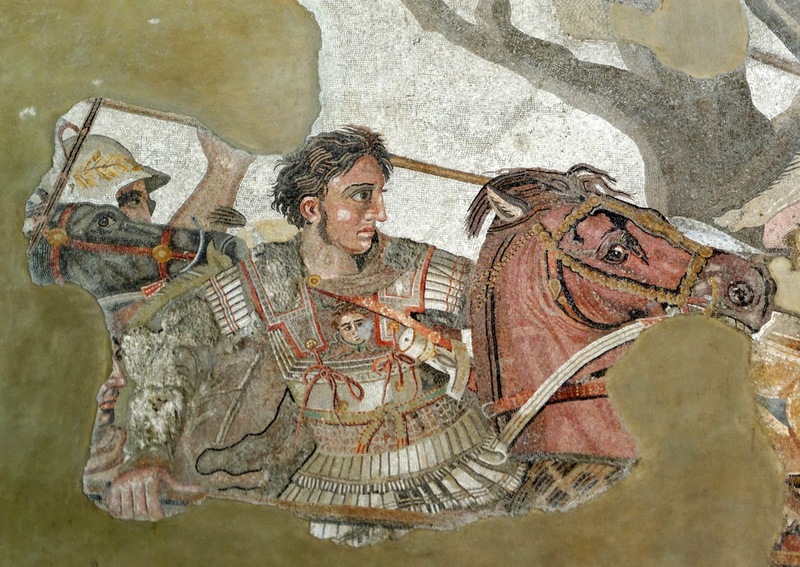 It portrays the 333 BC Battle of Issus, in which Alexander the Great secured a decisive victory over Darius III of Persia and gained crucial leverage in his campaign against the Persian Empire. 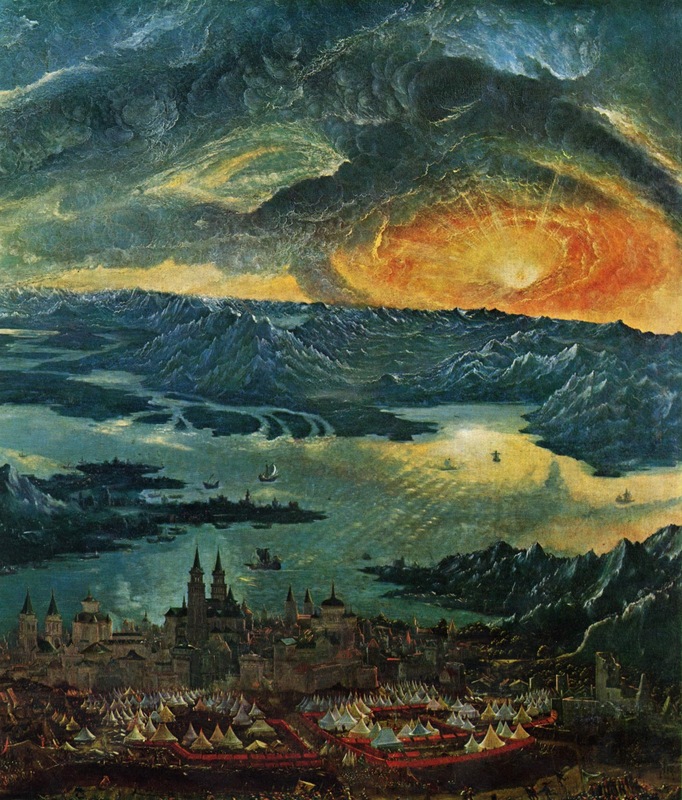 The painting is widely regarded as Altdorfer's masterpiece, and is one of the most famous examples of the type of Renaissance** landscape painting known as the world landscape, which here reaches an unprecedented grandeur. Duke William IV of Bavaria commissioned The Battle of Alexander at Issus in 1528 as part of a set of historical pieces that was to hang in his Munich residence. 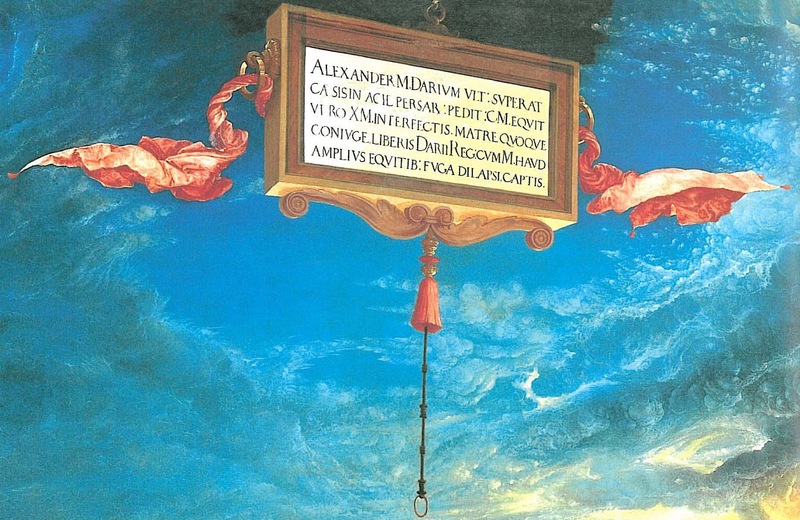 Modern commentators suggest that the painting, through its abundant use of anachronism, was intended to liken Alexander's heroic victory at Issus to the contemporary European conflict with the Ottoman Empire. 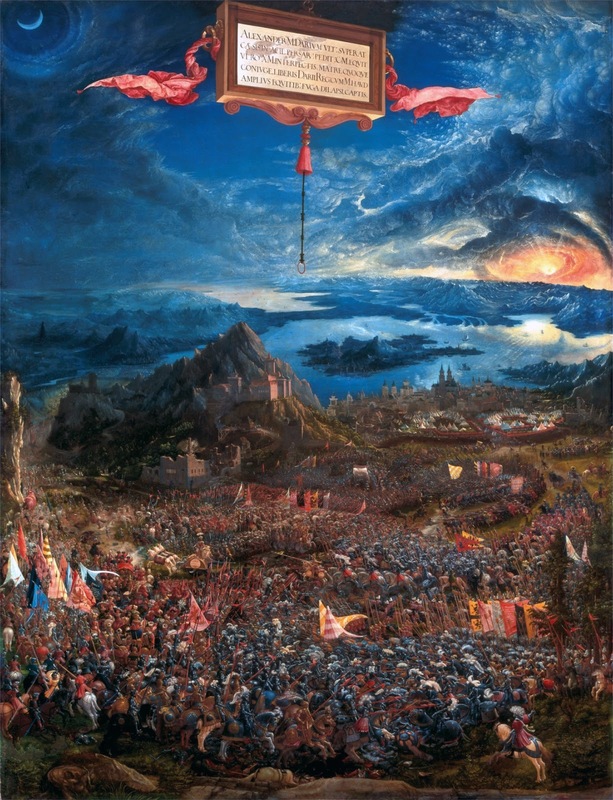 In particular, the defeat of Suleiman the Magnificent at the Siege of Vienna may have been an inspiration for Altdorfer. A religious undercurrent is detectable, especially in the extraordinary sky; this was probably inspired by the prophecies of Daniel and contemporary concern within the Church about an impending apocalypse. The Battle of Alexander at Issus and four others that were part of William's initial set are in the Alte Pinakothek art museum in Munich. The Battle of Alexander at Issus remained part of the royal collection of the Dukes of Bavaria for centuries. By the late 18th century, it was regularly featured in public galleries at the Schleissheim Palace. The painting was one of 72 taken to Paris in 1800 by the invading armies of Napoleon I (1769-1821), who was a noted admirer of Alexander the Great. The Louvre held it until 1804, when Napoleon declared himself Emperor of France and took it for his own use. When the Prussians captured the Château de Saint-Cloud in 1814 as part of the War of the Sixth Coalition, they supposedly found the painting hanging in Napoleon's bathroom. The Battle of Alexander at Issus and 26 others taken in the 1800 invasion were subsequently restored to the King of Bavaria in 1815. Five of the paintings in William IV's original set of eight - including The Battle of Alexander at Issus - later passed from the royal collection to the Alte Pinakothek art museum in Munich, Germany, where they remain; the other three are in the National Museum of Fine Arts in Stockholm, having been looted by the Swedish army in the Thirty Years War of 1618-1648. Susannah and the Elders is the only other work by Altdorfer in the Alte Pinakothek. "considered in splendid isolation from its fifteen other companion pieces, based on the assumption that it either metonymically stands in for the entire cycle, or that its perceived aesthetic predominance merits exclusive focus". German writer Karl Wilhelm Friedrich Schlegel (1772-1829) was one of many who saw the painting in the Louvre and marvelled, calling it a "small painted Iliad". La Battaglia di Alessandro e Dario ad Isso è un dipinto a olio su tavola (158x120 cm) di Albrecht Altdorfer, databile al 1529 e conservato nell'Alte Pinakothek di Monaco. Vero capolavoro, da alcuni è stato inserito tra i più affascinanti paesaggi dell'intera storia dell'arte. In uno straordinario paesaggio, visto a volo d'uccello e che si allontana a perdita d'occhio, si svolge la battaglia tra i greci di Alessandro Magno e i persiani di re Dario. Gli eserciti si scontrano nella parte bassa del dipinto, in un brulicare di figure, lance, armature e cavalli, che nonostante l'effetto da miniatura rimane perfettamente comprensibile. Si notano infatti i due schieramenti contrapposti, con movimenti opposti delle truppe che dai rispettivi accampamenti muovono verso lo scontro frontale. Alessandro, da destra, vestito di un'armatura dorata, si lancia all'inseguimento del cocchio di Dario, che tenta di fuggire verso sinistra. La scena è ambientata in un paesaggio alpino che ricorda Salisburgo e i suoi dintorni. Con un'eccezionale evocazione suggestiva, l'artista, ispirandosi certamente alla produzione dei cartografi che proprio in Germania era particolarmente fiorente, dipinse uno spaccato da un punto di vista altissimo, con l'orizzonte che si curva per effetto della sfericità terrestre, dove la tradizionale prospettiva aerea è magnificata dal gioco di luci e ombre drammaticamente contrapposte che nasce per effetto dell'alba del sole, a oriente, e dell'alta luna visibile in alto a sinistra al culmine di un turbine cilindrico di nubi, come se fosse per uscire di scena: chiaro è il simbolismo legato ai due comandanti. «Alessandro Magno, sconfitto l'ultimo Dario, tra 100.000 fanti e più di 10.000 cavalieri uccisi tra le file dei persiani. Mentre il re Dario è riuscito a fuggire con non più di 1.000 cavalieri, sua madre, moglie e figli sono stati presi prigionieri».